The conversation about VDI has moved from “whether” to "when” and “how.” In today’s fast-moving markets, a centralized approach to desktop and app delivery has become essential to help businesses become more mobile, flexible, agile and productive. 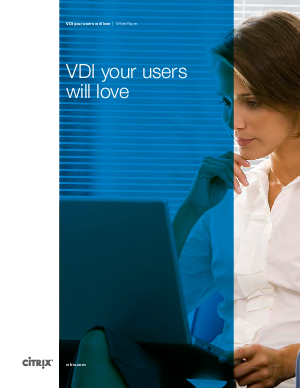 To be effective, though, your VDI implementation has to meet the needs of both your organization and your workforce. It’s not enough to virtualize your desktops if your organization remains unable to empower people with full productivity in any scenario. Your initiative has to be designed for the way we work now, anywhere, any time, on any device—not just on a PC or thin client in an office setting, but also on a tablet in a cafe or on a factory floor, or on a laptop in a home office, or even on a smartphone in the back of a taxi.